It's been a busy day. Lots of cooking and baking and good food shared with a friend. I'll share them with you soon. 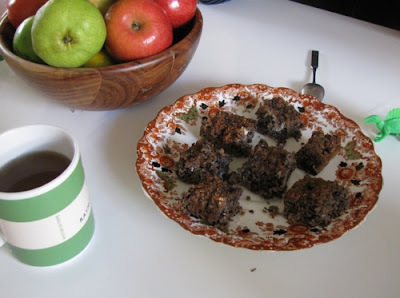 Today I have a quick post on some snacks I made last night to nibble before dinner. Smoky lime chickpeas, based on Susan's Chipotle Lime Peanuts. Peanuts are off the menu since we found out about Sylvia's allergy. However we all love chickpeas. Sylvia ate them plain for dinner but I baked some with the seasoning. It seemed a great way to use one of the limes off our tree in the backyard. It also meant I could serve up a fairly plain Scottish Vegetable and Barley Soup which is not high in protein. The chickpeas were lovely and full of flavour. The sharp lime flavour on the marinade mellowed with cooking. My only change would be to try a bit of garlic powder on them. I would have been interested to find how long they keep but we ate them all before dinner. They were quite soft so maybe they would have dried out in the fridge overnight. Must find out. The other joy last night was that Sylvia, who hasn't been too keen on veg lately, leaned across the table to where I was cutting up carrots and started eating slices off the chopping board. It is always nice when she decides to eat a vegetable rather than me having to convince her to do so. Once I saw she liked it, I cut a carrot into flowers (see an example in the photo at the top) and she loved it. If only feeding kids was always so easy! For other ideas about baking seasoned chickpeas see these Taco Chickpeas! 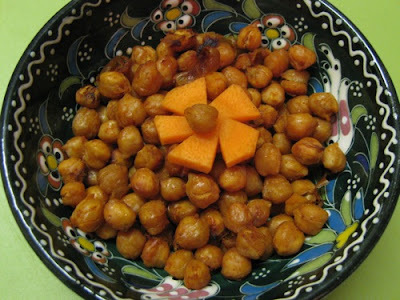 Update - Mel noted she had made crunchy chickpeas in the comments and kindly went away and blogged about them - I must try them. Mix all ingredients together and toss with chickpeas. Line a small roasting dish with baking paper and bake for about 20-30 minutes at 200 C. They are done when most of the dressing is absorbed. Eat warm or room temperature. Ours went in an evening so I am not sure how long they keep. Sylvia and I went to the zoo this weekend. We had a great time. I made muffins to take along. Later that night we ate the muffins with a salad I found in a new cookbook by Denis Cotter. However before I tell you about them I want to reflect (or rant, depending on your point of view) on a few things I have come across lately regarding being vegetarian. Vegetarian Kids: I recently was browsing through Kaz Cooke's Kid Wrangling: the real guide to caring for babies, toddlers and preschoolers. 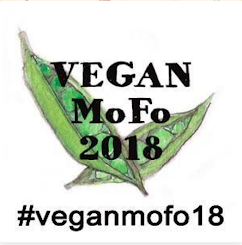 I was quite shocked to read the advice that "Many vegetarian parents allow their young children to eat meat ... because they see this as the best way for their kids to grow and develop in the early years." She went on to say that if you were raising your kids as vegetarians you would have to have it approved by a nutritionist and that your kids would probably be smaller than average. Unlike other chapters, there were no helpful quotes by vegetarian parents. There was no breezy information about those who did successfully raise vegetarian children. It didn't consider that parents who feel uncomfortable about eating meat might also feel uncomfortable about giving their children meat, or that they might let their child decide to eat meat rather than decide not to eat meat. In fact it made me feel like I was being told that I was a bad parent to bring up a child as a vegetarian. This attitude is not surprising, given the number of ill informed health professionals I have encountered. It wasn't until I saw a dietician at our children's hospital, while Sylvia was being treated for other issues, that I finally felt I had some good advice on Sylvia's vegetarian diet. Disappointing nevertheless from someone like Kaz Cooke who has produced so many incisive cartoons and always seemed to have her head screwed on the right way. 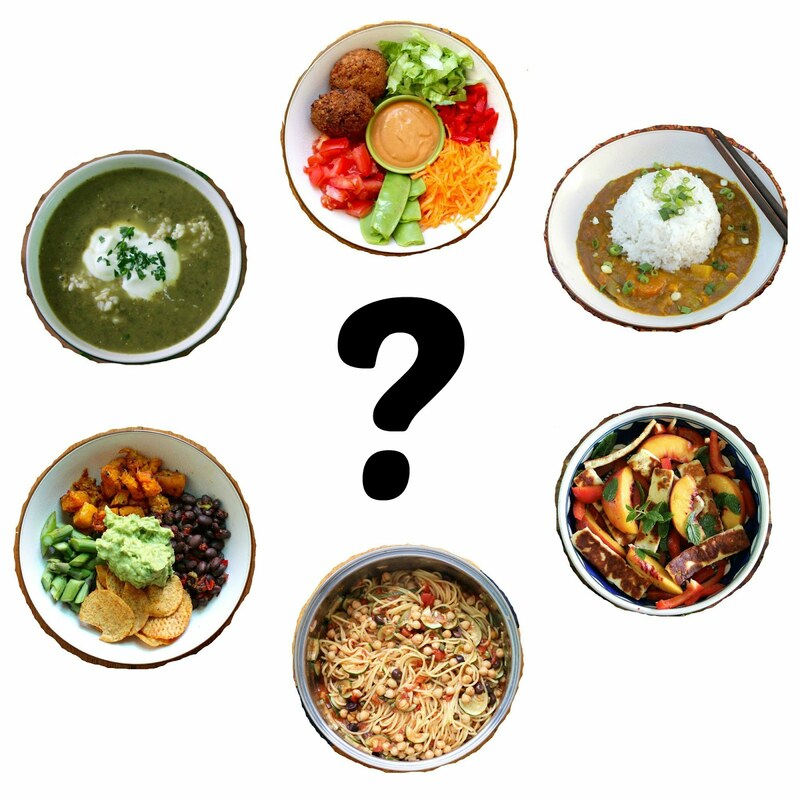 Vegetarians eat more than Vegetables: My next musing was prompted by an article in the Travel section of the weekend Australian newspaper about 3 weeks ago about vegetarian restaurants in New York (called something like "dining to a different beet" - it doesn't seem to be online). It was an interesting article but seemed to talk about new ways of serving vegetables. I love vegetables but the idea that this is all vegetarians need is silly. People love to talk about vegetarianism as a negative. You just take meat out of your diet. Meatless Mondays. Yet being vegetarian just isn't so simple. Why can't we have Tofu Thursdays or Soybean Sundays. Yes, yes, I know that no one would be swayed by them but at least it would make the point that it isn't just about subtraction. It is about transforming your diet. Loosen the edges of yourself: Transformation brings me to my next point. I heard an interview with film maker, Julia Leigh, where she talked about film loosening the edges of yourself. I really liked the concept. It got me thinking about how vegetarianism has loosened my own edges. It changes the person that I am because it makes me an outsider to mainstream culture at times. (That's why my salad dressing is smiling at me in the above photo.) When I studied Nazi Germany as a history student at the tender age of 20, I used to wonder what I would have done had I lived through it. Would I have blindly followed Hitler. With hindsight, I can gladly say that I don't think so. Though who knows. Lest these thoughts on vegetarianism, seem too negative, let me introduce you to Denis Cotter's new cookbook, for the love of food. My mum and dad recently visited my sister in Ireland and were lucky enough to eat at his restaurant in Cork. They brought home a copy of his newest book. I absolutely loved reading his previous book Wild Garlic, Gooseberries ... and Me but the recipes are quite time consuming. This book is less about showcasing unusual ingredients and more about home cooked meals. Before I became vegetarian, I was attracted to a vegetarian diet. I love the way vegetarianism focuses getting nutrients through eating a variety of vegetables, legumes, nuts, fruit and grains. Perhaps I could be so bold as to say it is a wholistic approach to diet. What I love about reading Denis Cotter's recipes is that he gets it. What joy it is to read a chapter on salads that are satisfyingly full of vegetables and proteins. After my mum brought the book (and a wedge of pumpkin) with her on a visit, I found myself reading it in bed and thinking I have every thing I need to make that salad of brussels sprout tops, pumpkin and borlotti beans with a maple sesame dressing. Easy! So the next day I made it after work. As usual, it took a bit longer than I had hoped but it wasn't too onerous and it was very tasty. (We had leftovers which didn't keep that well.) I had leftover dressing and thought it would be an excellent dipping sauce for veg but haven't tried that. Only after I made the salad did I re-read the recipe and wondered what brussels sprout tops were. I just used regular sprouts. I served the salad on the first night with boiled potatoes which was surprisingly good. When I served up some leftovers I made some veg sausages to go with it and also the carrot muffins based on my smoky parsnip muffins. The sausages tasted excellent but looked so odd that I might try them again before posting. The muffins were light and tasty. I was particularly pleased that they worked because halfway through throwing them I found we were out of milk so I substituted soda water. It seemed fine. Sylvia wouldn't eat the muffins but she is picky. I was glad of them as an alternative to any of the food at the zoo. I like alternatives. Roast pumpkin for 30 - 50 minutes in a hot oven (I think I did 50 minutes at 220 C) until pumpkin is soft and starting to char on the edges. Cook onion for about 10 minutes in 1 tsp oil in a large frypan. While pumpkin and onion are cooking, make dressing by stirring all ingredients together until smooth. Preferably use a bigger bowl than mine! When pumpkin and onions cooked, add brussels sprouts and a tablespoon of oil to the frypan and cook over high heat for 5-10 minutes until leaves soften but keep their brilliant green. Add borlotti beans and stir them a minute or two to warm them. Scatter with pumpkin and dollop some dressing on them. Serve warm. Mix carrot, thyme, cheese and flours in a large mixing bowl. Mix soda water, oil and egg in a small bowl with a fork until mixed. Spoon into greased or lined 12 hole muffin tin. Bake at 180 C for 20-25 minutes (I baked mine for 25 minutes). Cool on a wire rack. Best eaten when room temperature. What to tell you first? That I love Rose Eliot, respected elder of British vegetarian cookbooks. That I wish I knew what cookbook writers tasted when they made the recipe. That bananas are horrendously expensive in Melbourne following the Queensland cyclone and some would gasp in horror at putting them in a curry. That dinner is always an adventure with Sylvia in the kitchen. Let's start with Rose Eliot. I have admired her for a long time. When I first went vegetarian I was introduced to her cookbooks and have been buying them ever since. She has a prodigious output. One of her more recent books (2006) is called Vegetarian Supercook. These recipes are fresh and modern compared to some of her older books. Yet it has taken me over a year of owning the book to actually cook from it. Blame blogging. Blame a busy life. Blame the tyranny of choice of too many cookbooks. Thankfully the Cookbook Challenge is prompting me to return to some of my unused cookbooks. The Cookbook Challenge theme last fortnight was spice. I took the opportunity to finally make Rose Eliots's Banana Curry with Cashew Rice. Sadly, the spice was rather understated. I have had so many dishes work from her cookbooks that I wondered why this one didn't seem quite right. I changed a few ingredients but I also disagreed with a couple of things. Her suggestion of tossing cashews through rice seemed unnecessarily fiddly. It was easier to sprinkle cashews on top. Cooking dinner seems to take longer than ever these days. I take any shortcuts I can. As you will see in the photo below, Sylvia still has a different dinner to us many nights. I often offer her some of what we have but I have enough problems getting her to eat the plain food she prefers. Sylvia was eating dinner while I was cooking but not terribly interested in it. I turned around at one point and found she had climbed into her toy pram with two dollies on her lap. I much preferred it when she ran into the loungeroom to dance around the room while eating a tofu nugget. I wish I knew why she is not so keen on vegetables suddenly, then tells me I am "a bit naughty" if I try eat a piece of the fruit that I am sharing with her (because don't toddlers own the whole world). I hope you get the picture of how much constant supervision is required to try and get her to eat. A few disclaimers. My bananas might not have been as green as Rose intended - beggars can't be choosers when racing around the shops (especially when I got to Brunswick St at 10am on the day in question, only to find that the shops I needed were still closed, so I had to return to our local pool for Sylvia's swimming lesson, and then back to Brunswick St where Sylvia made mischief in the Brunswick St bookstore). I didn't quite cook the potatoes enough the first night (but a burst in the microwave for the potatoes before reheating the following night fixed that). I probably cooked the meal a bit longer than Rose intended (see above.rant about Sylvia). E looked at the fresh bunch of curry leaves and said they looked like a hedge. He thought some curry powder might improve the meal. I loved the spices on paper but it needed a bit more oomph. Perhaps it would work better in summer with the delicate flavours and the fruit. I've wanted to try banana in curry for ages. 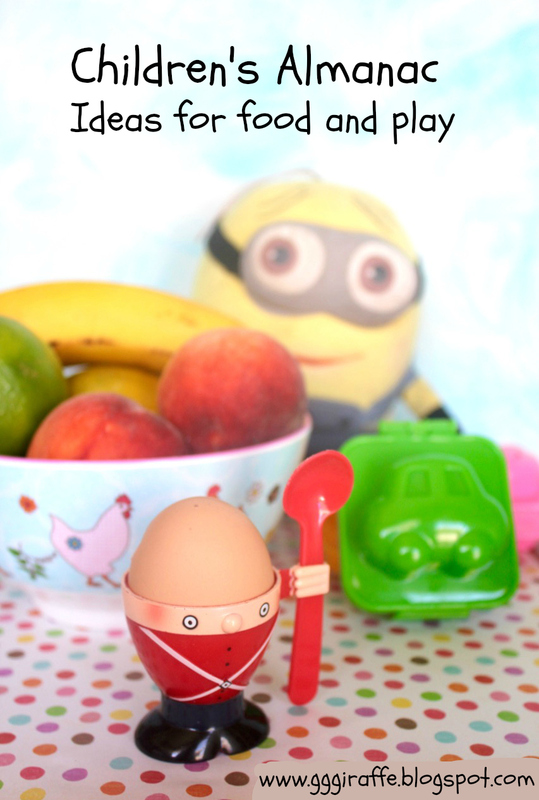 My interested in bananas in a savoury recipe was piqued by this adventurous recipe. I am glad I have finally had my first experiment. It may take a few more goes before I am convinced I got it right. It is not a difficult or time consuming recipe and with a bit more spice, I think it might be lovely. 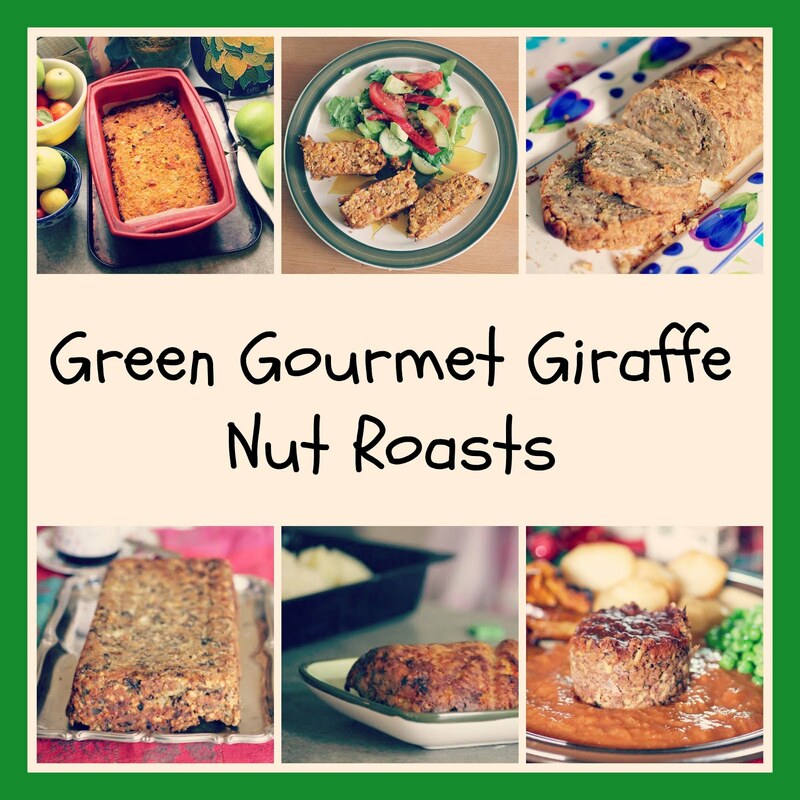 To see what my fellow Cookbook Challengers made with spice, go here. Cook potatoes for about15 minutes until cooked but not falling apart. Drain and set aside. Cook the rice and set aside. Meanwhile, heat olive oil in a large saucepan and fry onion and green capsicum for about 10 minutes over medium heat. Stir in mustard seeds and heat a minute or two until they pop (though I am not sure if mine popped). Add curry leaves, turmeric, ginger and garlic and stir for about a minute. Add coconut cream, tamarind paste, salt, bananas and cooked potatoes and cook for about 5-10 minutes until bananas start to soften. Serve hot over rice and sprinkle with roughly chopped cashews. It took me some time after I became vegetarian to discover that most marshamllow is made with gelatine and hence is not vegetarian. I don't miss it much. Actually I do eat marshmallow from time to time but I have never tried making it at home. There is no gelatine in my kitchen. I would have no need for a vegetarian version if not for one of my favourite childhood slices that has a marshmallow topping. For years I have been telling myself I will try making it. Finally I have made a vegetarian version of my mum's slice. No gelatine was involved. A packet mix and a candy thermometer were needed, however, to accomplish this feat! Vegetarian marshmallow seems a tricky business. Lysy's experiments had made me wary. It wasn't until I found the Angel Food mix that I felt I might actually do it. Then I discovered I needed a candy thermometer. Another mental hurdle to leap over. I love baking but shy away from candy recipes and the precision needed in heating a bubbling sugary mixture. It seemed a downright dangerous thing to do. I let the candy thermometer sit in the drawer for some months before I would go near it. That is how much I loved my mum's marshmallow slice. It was worth facing my nemesis in the kitchen. The slice is the perfect mix of soft, crisp and crunchy. It melts and crumbles and pleases with all the hallmarks of a great slice - cocoa, coconut and processed foods (yes often the processed foods are condensed milk and bikkies for me but in this slice it is the weetbix). I confess that my mum gave me the recipe ages ago over the phone. I scribbled it down and then I lost it. So I found it again while at home over Easter. This is the cookbook I told you about back then. 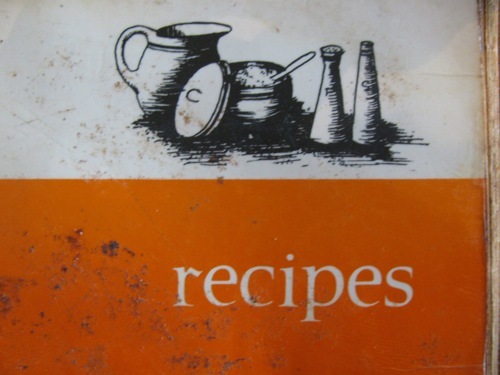 It is merely called Recipes with no author, publisher or date. I love not only the recipe that reminds me of how I would read recipes as a child - so different to today - but also the splatters all over the recipe that show just how often my mum used it. The base was the easy bit. As always, Sylvia was keen to help out. She and dolly helped to crush the weetbix that go in the bottom layer. While the base cooled, I faced the challenge of making marshmallow. It was a fiddly job with lots of steps. The package I had came with an A4 page of instructions. I had to read it over and over to try and get my head around what I needed to do. I also found the instructions online at Angel Food. This confused me further as they were slightly different, and the package size was also a bit different. I really love this slice or I never would have bothered. First task was to boil package A with water and sugar. This was my moment to use my thermometer. I had to practice clipping it on the side of the saucepan a few times because I was quite nervous about it. Of course it wasn't as scary as I had feared. Though it might have been easier if I wasn't needing to take a Mexicale Pie out of the oven while the mixture bubbled and boiled. Package B was then beaten with a little water and the sugar syrup drizzled in while beating. I think this marshmallow is the longest I have ever let my beaters go for. It must have taken me 10-15 minutes until it was white and creamy. Sylvia watched with fascination. Finally I could pour the marshmallow mixture over the base. It was so satisfying to get to this step where I was just waiting for the marshmallow to cook. And the verdict? At first I was slightly disappointed. The base seemed rock hard and the marshmallow was overwhelmingly sweet. In fact the marshmallow mix had twice as much sugar as the one in the original cookbook recipe. E wisely suggested that I lop off some of the marshmallow. I cut the slice into squares and cut about two thirds of marshmallow off each square. That made them taste better. After a day or two the base had been softened by the marshmallow and it tasted just like the one mum makes. I was so happy with it and felt like Proust's protagonist with his madeleines. Meanwhile I had a bowlful of marshmallow off-cuts that sat in the fridge for a week. It was so sweet that I couldn't bear to eat it by itself. I considered baking it into a muffin but ended up fulfilling a wish to try rocky road. I bought jersey caramels, coconut diced, violet crumble, marshmallow, turkish delight, orange candied and 45% chocolate (that is $25 worth of ingredients). But when I melted the chocolate to pour over the ingredients, the marshmallow just melted and made the chocolate odd. We ate most of it and threw out the last bit because the turkish delight and honeycomb melted after a while. I am not sharing the recipe but suggest you check out Lorraine and Baking Addict's versions that inspired me. 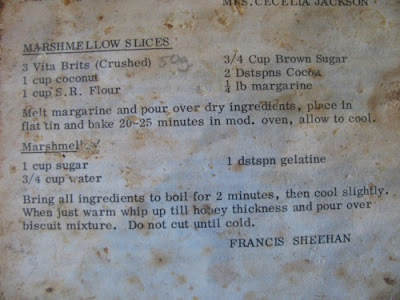 As for the slice, I think I might make it again. For any of you who buy the Angel Food marshmallow mix and have a tendency towards to procrastination, I can reassure you that my package was almost 5 months older than the best before date and still worked. I had been worried it wouldn't and bought another packet with a later best before date as a back up. I think I will probably make this slice again some time to use the other package but am not quite sure what I will do with the surplus marshmallow. Any ideas? To make the base, melt butter and pour over dry ingredients. Mix until combined and spread into a lined and greased small slice tin. Bake at 180 C for 20-25 minutes. Cool in the tin. Make marshmallow. If you eat gelatine you can make it the traditional way. My packet was made up of modified starch, rice starch, agar and emulsifiers. I boiled water and sugar with one package. I beat the other package which seemed to be quite starchy (not sure if the agar was also in the mixture) and then gradually added the sugar mixture and beat this for 10-15 minutes until it was creamy. When marshmallow mixture is a honey thickness pour over cooled base. Allow marshmallow to cool and set - I put mine in the fridge. Eat at room temperature. Mine kept out of the fridge in a air-tight container for about an hour. It was a good weekend for making food. I baked scones and bread and made a great soup (with brussels sprouts instead of peas), and we made fruit balls and almond energy snacks. It is the season for hunkering down in a warm house with soup simmering on the stove and bread dough rising in a bowl. Life is not quite as simple as that. Sylvia has lots of energy so we try and get out to the park to limit the energy she has for dragging chairs about the kitchen to see what I am doing, patting my bread dough and plunging her fingers into my scones. We were surprised on Saturday to find our regular park down at Coburg Lake had been pulled up and a new one is being installed with lots of dirt still about. "We don't want to go to a dirty park," was Sylvia's refrain. Instead, we went up the hill to another park. Back at home, I decided to bake some blueberry scones. I was interested in the recipe in the Rose Bakery Breakfast, Lunch, Tea cookbook. Yet when I checked the Australian Women's Weekly, their blueberry and ginger scone recipe was simpler with no eggs and very little butter. It was the sort of recipe my mum used to make so I stuck with it. I used a handful of wheatgerm from the Rose Bakery recipe and I added some choc chips on a whim. I actually was glad Sylvia was out the front in the sun with E and Zinc while I rubbed the butter into the flour. But she cannot resist my baking and had to come and see what I was up to. We ate the scones warm out of the oven and they were lovely. All they needed was a lick of butter, though you could add jam or honey if you wanted a little extra sweetness. I loved the barely sweet scones with the added flavour of ginger and bursts of sweetness from chocolate and blueberries. The only change I might make it to add only choc chips or blueberries in future. The scones didn't last long. They are not meant to. In fact the recipe said they are best on the day. I agree yet they were still yummy the next day. Maybe this was a result of my very soft dough. I love baking but can't do it every day. So Sylvia and I made some fruit balls. They are such a simple and delicious snack. I love them so much I have been looking at more energy ball recipes. Perry's Plate and Lululemon have lots of great idea. I adapted a recipe for Elissa’s Portable Breakfast Balls from Lululemon. Elissa didn't blend hers at all but I wanted Sylvia to taste them so I blitzed them. These were rolled late at night while Sylvia slept and bread baked. I was disappointed at first. E made a face when he tasted them. Sylvia just spat them out. Fortunately I gave them a second chance and have enjoyed a few. Work was intense with back to back meetings so I was glad of a little energy hit. These energy snacks are packed with nuts and seeds. They taste nutty, toasty and only slightly sweet. In future I would do less grinding of the seeds and coconut. But I have an urge to experiement with some more combinations, once this batch is gone. We like to try new things in our house. On the weekend, Sylvia was delighted in a new house for dolly, made by cutting windows and a door into a cardboard box. If you look in the windows, you might notice that dolly has a little bowl beside her with a fruit ball and maybe a nutty energy snack as well. I am sending the scones to Nayna at Simply Food who is hosting the Breakfast Club this month with berries as the theme. Preheat oven to 220 C and grease an oven tray. Place flour, wheatgerm and baking powder into a largish bowl. Rub in butter to resemble fine breadcrumbs. Stir through choc chips, blueberries and ginger. Make a well in the centre of flour mixture and pour in milk and water (I found 1/2 cup water a bit much so I would start with 1/4 cup and add a bit more if it was too dry.) Gently mix through with a butter knife until it come together into a soft dough. Briefly knead on a floured board until the dough is smooth. (My dough was really sticky so I needed quite a bit of flour to be able to handle it.) 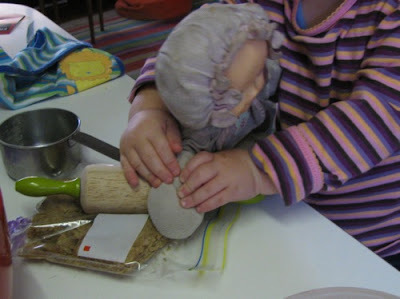 Pat into a circle of about 2cm and use a floured scone cutter to cut scones. Place on greased tray, almost touching. Brush with milk. Bake for 15-20 minutes until golden brown. Eat fresh or keep wrapped up in a teatowel. Toast the oats, sesame seeds, coconut, sunflower seeds and almonds, one at a time on a hot dry frypan. I ground it all up in a food processor but I think next time I might just grind the almonds and maybe the oats. Add remaining ingredients to food processor until it adheres together in a clump (or just stir by hand if you don't grind it all). Rolls into small balls about the size of a walnut. I have such good intentions to return to old recipes and yet the ingredients drive me down the road less travelled. This week I had lots of leftover rice that I intended to make into a rice gratin, despite having no eggs to spare. (Sylvia is having a boiled egg every morning so I have to account for these at the moment.) Time was also tight. I thought maybe I wouldn't bake it and then I remembered Vegan Yum Yum's tahini sauce which would use a lime from our tree. Dinner looked very different from what I had planned. Eating dinner was also very different to how I had planned it. I knew it was taking too long to eat before Sylvia went to bed but I had thought we might get her down to sleep and eat. However it was just one of those nights. She refused to sleep no matter what we did. Finally I thought she was settled. We sat down to eat on the couch in front of the telly and after a few mouthfuls she started crying again. Not the most relaxing of meals! At least it was very tasty. I wish Sylvia would eat this sort of food. We had a multicultural day at her child care this week. It was hard to know what to make to represent her culture. 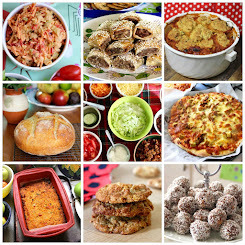 I eliminated sweet food (not ANZAC biscuits, shortbread, hedgehog and grubs), nuts (there went sausage rolls, haggis and nut roast), anything that was best fresh (so no pumpkin scones or damper), or anything that was difficult to transport and tricky for kids to eat (no pumpkin soup either). Plus Sylvia likes her food plain. So what did I take? Bread and cheese. Sylvia and I made potato bread to represent her Irish roots and we took cheese so she would have some protein with her lunch. I felt like we took the most boring food to child care. But you and I know that the way we eat at home is quite different. This time three years ago: Pumpkin in a Smoothie! Heat oil in a large frypan and slowly fry the leek and kale for about 20-30 minutes. (Vegan Yum Yum used kale and cut the stalk out of hers but I kept mine in the dish which meant it took a bit longer to cook.) Add garlic, thyme and zucchini. Cook another 5-10 minutes until the zucchini is soft. While the vegetables are cooking, make the tahini lime sauce by mixing all ingredients together in a small bowl. I also had rice that had been in the fridge and ran it under boiling water before adding to the frypan. Add rice, tahini lime sauce, baby spinach, baby kale and cashews. Stir together to mix well and cook a few minutes. (If you have to settle a crying baby you can let it rest until you are ready to eat.) Serve in bowls topped with chopped tomato. Will keep well overnight in the fridge. My friend Junko and her little girl came over for lunch this week. Of all my friendships, the one with Junko reminds me to be hopeful about friends. I first met her over 20 years ago while she was on exchange from Japan. When she went home at the end of the year I thought I would never see her again, despite her promises. She kept her word and, despite living in different corners of the globe, has returned to Melbourne again and again. Now our girls play together. The world is a wonderful place! I told her I would make a simple lunch. I knew what we would eat because I had plans to make a Pumpkin and Roasted Corn Soup and Blueberry Breakfast Cake from Susan of Fat Free Vegan. I tweaked both recipes. I decided to roast the pumpkin as well as the corn for the soup. After all it was for Jacqueline and Lisa's No Croutons Required event - the theme is Grilled or Roasted soups or salads this month. I had planned to whip it up for dinner but was waiting for an evening when I had time for roasting. Making the soup for lunch was even better. Soups are always improved by resting overnight. Once I started roasting pumpkin I couldn't resist sprinkling some spice on it, as Kathryn recommended. I then got it in my mind to add some smoked paprika and maple syrup. Even with adding stock and salt I found it quite sweet and rather smoky. With some roasted corn, it had lots of texture and flavours. E told me he loved the soup with the burnt corn so I wont be turning to him for recipe names any time soon! On the same evening, I made the Blueberry Breakfast Cake. This was inspired by another event. Ricki and Kim's Savoury or Sweet (SoS) Kitchen Challenge, with blueberries being the theme of the month. This event is about sharing recipes that use whole foods, whole grains, vegan ingredients and natural sweeteners. That is a challenge for me when it comes to baking. One that I am slowly getting better at. In Melbourne, it is the time of year when blueberries are in our freezer rather than fridge because fresh blueberries are out of season. But when they are in season, E and Sylvia gobble them up. I liked Susan's recipe but wanted to try out a few new ingredients. Recently I have bought coconut sugar and coconut flour for the first time (from La Manna Fresh in Sydney Road). According to these sites, the sugar is low GI, rich in minerals and not highly processed, and the flour is high in fibre, gluten free and a good source of protein. Working out how to use the coconut sugar has been easy. I've almost used up the packet and am just sorry that it is so expensive. I love the toffee flavours and it was fantastic sprinkled on top of the cake. The coconut flour is more of a challenge. I am still a little unsure how it changes the texture and taste of baked goods so I am unsure how to use it. This was my first attempt. For the first time in ages, the cake was studded with flour bombs (little pockets of uncooked flour) so I think I may need to sieve the flour. The cake was quite moist but I suspect this was due to my decision to replace the egg replacer with a flax egg. I also used oil because I didn't have any applesauce. I loved how purple the cake was with all those blueberries. I started baking it before dinner with Sylvia but got distracted by a visit from the neighbour and making the soup and dinner. Before I knew it, it was late and there was still a bowl of flours waiting to be baked. Fortunately it came together quickly. It was a hit with both E and Sylvia. Junko enjoyed it too. Fortunately for us, E was home that day because he was feeling poorly. He supervised our girls at play while we played ladies who lunch. It was a luxury to be able to catch up with each other without being distracted by small children. We ate some cake with our tea and then I cut up some fruit (see top photo) and we nibbled at that while we talked. A most pleasant lunch! In a large roasting dish place olive oil, pumpkin, onion, garlic and spice mix. Toss together and roast for 45 minutes at 220 C or until pumpkin is soft. Take the garlic out of the skins. Place garlic flesh in a large saucepan and discard skins. Tip the rest of the pumpkin and onion in the saucepan. Place corn in the roasting tray, spray with oil spray and roast about 30 minutes. I then left my corn in the oven while it cooled. Cut the corn off two of the cobs and add to the saucepan. Set the other corn cob aside. Add remaining ingredients to the saucepan and puree (I used a hand held blender). When you are ready to serve, cut the corn cobs off the last corn cob. Spread on an oven tray and place under the grill (broiler) to brown up a little. To serve, ladle soup into bowls and scatter grilled corn over each bowl. Variation: I didn't have quite enough left for dinner so I increased the quantities of about one third of this soup with about a cup of cooked rice, half a tin of lentils, a spoonful or two of yoghurt, a couple of spoonfuls of this mash, and some extra stock. This was great and did me for lunch the next day as well. Preheat the oven to 180 C or 350 F. Grease and line a small slice tin - or a 20cm square tin. Mix ground linseeds and water and set aside. Blend 1 cup of blueberries with1/2 cup water until coarsely chopped (rather than completely pureed). Tip blueberries, linseed mixture, lemon juice, oil and vanilla into the dry ingredients and mix until combined. Spoon batter into prepared tin and smooth with the back of a spoon. Sprinkle with sugar and cinnamon (I didn't actually measure mine). Bake for 25-35 minutes (I baked mine 25 minutes) or until coming away from the edges of the tin and a skewer inserted comes out cleanly. Sit in the tin for at least 15 minutes before turning out onto a rack to cool. Eat warm or room temperature. The past year has been wet and cold. Even our summer was noticeably wetter and colder than usual. I didn't have days of panic when it was so hot that I worried about how our citrus trees would weather the weather. Now that winter is here, we have the best yield of fruit since we bought the trees three and half years ago. It is time to take you out to the garden before sharing the kale pesto recipe today. Even before our citrus trees arrives, we had a fledgling camellia tree that my parents gave to us one Christmas. This photo is specially for my mum who has watered and pruned and nurtured the tree when she has been here looking after Sylvia. She was away during most of the flowering of the tree this year but I am sure she would be proud of it. Our garden doesn't have much in the way of flowers. I have tended to focus on more utilitarian plants. Yet I am glad for a little flowering bush to teach me that it is a wonderful feeling to see them bud and open into a burst of colour and beauty. Here is a close up of one of the camellias. As for the citrus trees, I was a bit worried about this earlier in the year. They seemed to have the lumps that were the sign of the gall wasp. Apparently it is quite common in our parts. On the advice of a friend's brother, I brutally pruned the trees. Even my mother, the queen of pruning, looked askance at my handiwork. Yes the trees have grown back with lots of healthy green foilage and produced a good amount of fruit for young trees that live in pots. Though I am not sure if my pruning is the reason why the meyer lemon tree has been a little lopsided and has a bunch of lemons down on one side. This is our lime tree. It was the smaller of the two trees when we got them so I have always felt a little more protective of it. In past years, we have had some baby limes start growing and then drop off the tree. This year we have had real limes growing. The only thing that is a bit odd is that they are yellow. It is a bit confusing with the lemons also being yellow, but once you cut them open it is quite clear if they are lemon or lime. Nevertheless it is such a joy to have a backyard full of life. Now it is a terrible thing to confess, but our bounty has stripped me of ideas for cooking wit lemon and lime. Fruit from the garden is special and demands exceptional recipes. What to cook! It is winter so I don't feel like tangy salads and lots of Mexican dishes. I don't like sweet lemon desserts. What to cook! I bought some kale at the market last Friday and decided to finally attempt a kale pesto. I was originally inspired by this lemon spaghetti on Fitter than Choc. I especially loved the vegan parmesan that Kayla made with walnuts and nutritional yeast flakes. I then found a couple of kale pesto recipes. One had parmesan which I didn't have and the other didn't have enough seasoning. One used fresh kale and one used boiled kale. I decided to do my own thing and add some white miso like Kathryn suggested. I had some pasta that Sylvia had taken a shine to in the supermarket. It was sort of like a thick and curly-edged fettuccine. The brand is Divella and the type of pasta is Mafaldine, neither of which I am familiar with. I loved it. It held the pesto wonderfully and was quite easy to eat. I was pleased that Sylvia ate a few pieces with the pesto before it got too much. Then she reverted to eating plain pasta I had set aside (and when there was no plain pasta left she dragged her chair to where the colander sat and checked for herself). E and I had some fried broccoli, tomato and chickpeas on top. I had some leftover chickpeas that Sylvia wasn't eating. Forgetting the pesto was full of nuts, I threw them in to bump up the protein of the meal. The following night we had a dinner crisis where I found I didn't have as much to serve as I had thought. I put aside the soup for lunch and made a mash with the kale pesto (recipe below) that I served with vegie sausages, peas and roasted cherry tomatoes (20 minutes at about 220 C). It was an equally delicious way to eat the pesto. I am sending the Pasta with Kale Pesto to Julie of Pictures of All My Princesses for Presto Pasta Nights #217, the event run by Ruth of Once Upon a Feast. I am sending the Cauliflower, potato and kale pesto mash to Winnie from Healthy Green Kitchen who is hosting this week's Weekend Herb Blogging #288, the event coordinated by Haalo and founded by Kalyn. Two quick items of note to finish on: hurrah for packham pears being in season and happy Bloomsday tomorrow! Wash and roughly chop the kale. Heat olive oil in a large frypan over high heat and fry kale for about 2-3 minutes. Dry fry the walnuts in a small frypan over a lowish heat for a few minutes or until they smell cooked. Blitz the walnuts and nutritional yeast in the food processor. Add kale and remaining ingredients. Process until smooth. I actually transferred it to a small blender attachment I have for my hand held blender which made it far smoother. Cook potatoes and cauliflower for 15-20 minutes until soft. Drain. Add milk, butter and pesto. Mash with a potato masher. Give a good stir and check seasoning. I added a bit of seasoning because it was too hot to taste it well. You would probably do well to let cool a bit before adding seasoning but it depends on how hungry you are. I love reading foodie magazines but I never make as many of their recipes as I intend. Then they pile up in the house and I go through them in moments of good intentions. I had one such moment recently and found a recipe for Banana Oat Hotcakes in a freebie magazine from a local supermarket. Having tried oaty pancakes before, I was quite keen on one that had fruit inside it as well. Sylvia is quite keen on pancakes so we have had them a few times recently for weekend brunch. We had a lazy morning yesterday. It is a long weekend here. No need for hurrying. Sylvia helped with mixing as usual. She also insisted on bringing the chair to the stove to watch them frying. 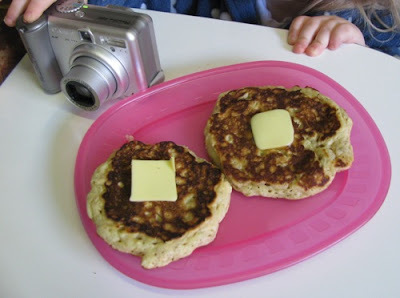 She is already showing that she is the daughter of a food blogger. Lately, when I have got out my camera, she wants to take photos. I found an old digital camera for her. When I served her some pancakes she was clicking away. She still needs to learn about the direction to point her camera. She loved the pancakes. Well she ate some of mine and then one of her own. It is amazing watching her curiosity. She was interesting in cutting them up with a (plastic) knife and then eating them with a fork. I shouldn't have let her use the ceramic plate because she managed to send it clattering across the floor and got a wee fright. E was having a sleep-in. His pancakes were cold by the time that her got up. I don't mind cold pancakes but I couldn't believe he warmed them up by toasting them. I was most displeased. "Are you a bit naughty?" Sylvia asked E. From the mouths of babes! I loved the pancakes. I think I prefer the denser texture of the oat pancakes to the ricotta hotcakes I made recently. I made only minor amendments to the recipe. I only had one banana so I halved it, which is really enough for our household. I only realised as I was making these that the recipe called for instant oats. 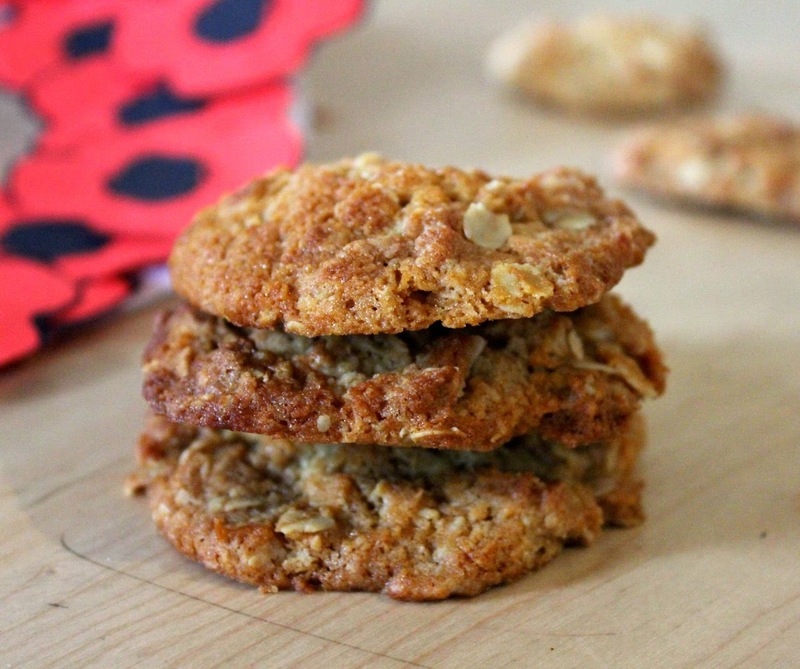 I only stock rolled oats these days so I used these. They were fine but might have benefited from a little soaking so I have altered the recipe slightly. In an ideal world I would have made a raspberry sauce with the berries I have in the freezer but as usual I got distracted. They tasted excellent with maple syrup. E and Sylvia preferred honey. Definitely a recipe to repeat. I was particularly keen yesterday that Sylvia have a good breakfast. I was glad she had pancakes and a boiled egg. 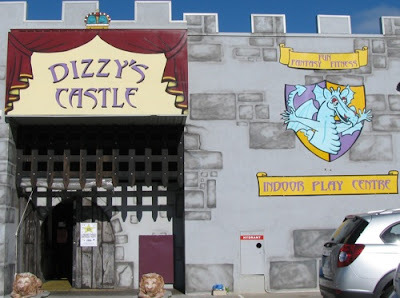 We went to her cousins joint birthday party at Dizzy's Castle at lunchtime and the food was fairly ordinary, though Erica and Andy brought along superb gf chocolate birthday cakes for the birthday boy and birthday girl. The kids weren't that interested in the food. They were far more excited by all the play equipment. It was only my second visit to one of these indoor play centres and Sylvia and I learnt the hard way what a drop slide is. I was happy when her cousins took her off to explore all the climbing, little cars and balls. She had a lovely time and has been telling us all about it today. I am sending these pancakes to Yasmeen at Health Nut who is hosting this week's Weekend Herb Blogging #287, the event coordinated by Haalo and founded by Kalyn. Melt butter and golden syrup together in microwave (or on stovetop). Add banana, egg, milk, vanilla and oats. Add flour and baking powder. Mix til you have a thickish batter. Heat a frypan over medium heat. Melt a little butter in the frypan and use a paper towel to wipe most of it off so the pan is liberally greased rather than awash with butter. Drop dessertspoons of batter into the frypan. Fry a few minutes until a few bubbles appear and the mixture dries out a little to look cooked. Flip over and fry another minute or two until the other side is golden brown. Serve warm with butter and golden syrup or honey. Update 4 May 2013 - am still making these regularly. 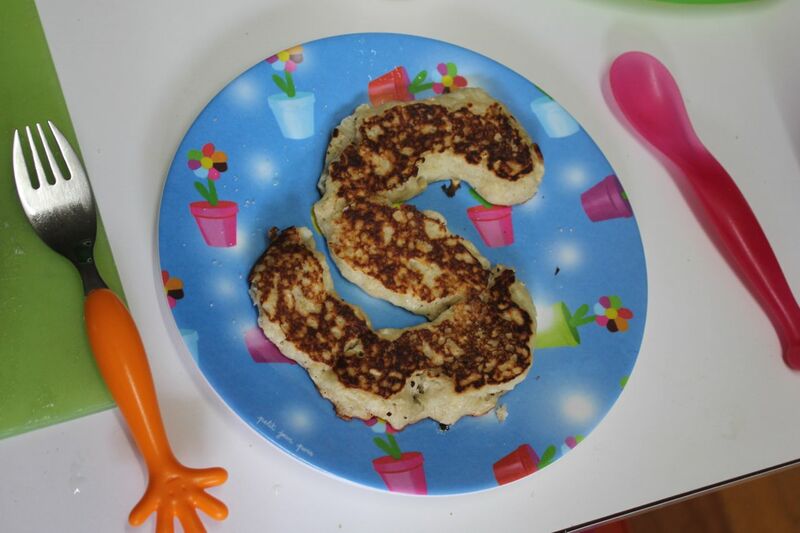 Sylvia likes her pancakes in the shape of her initial. Have tried to veganise them with chia seeds instead of egg but a bit soft. Today we were out of soy milk that I usually use these days. I used coconut milk, added 1/4 cup dessicated coconut and only 1/2 cup self raising flour (and upped the baking powder to 1 tsp), and I used 1 and 1/2 banana. They were lovely and light and a little tropical. Update February 2015 - we are still making these pancakes regularly. 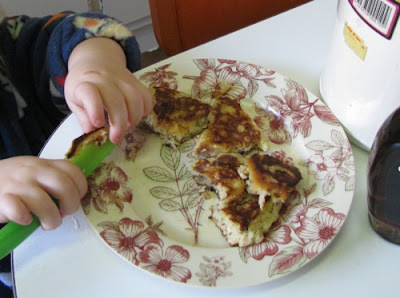 I have posted a vegan version of the Banana Oat Pancakes that we make if I don't have eggs in the house.